Set in a rural location in the heart of the Normandy countryside, 5 minutes from the market town of Pont Audemer, this traditional ‘chocolate box’ detached cottage set within the same spacious grounds as the owners, maintains its authentic Normandy charm but offers modern amenities. The cottage sleeps 6 people. Downstairs, there is a separate fully equipped kitchen, dining room and lounge with a large fireplace. A double bedroom and bathroom/WC complete the ground floor. Upstairs a landing leads on to two bedrooms, each with 2 single beds and a second bathroom with bath and WC. A large garden with patio/terrace and private car parking for the cottage. The cottage is ideally situated for visiting the many attractions nearby. Within one hour’s drive from Honfleur and its picturesque port, Deauville & Trouville and their beaches, Rouen & its cathedral and cobbled streets, Caen, Le Havre, and many historical monuments. The property is adjacent to the local woodland from where numerous walks are possible. 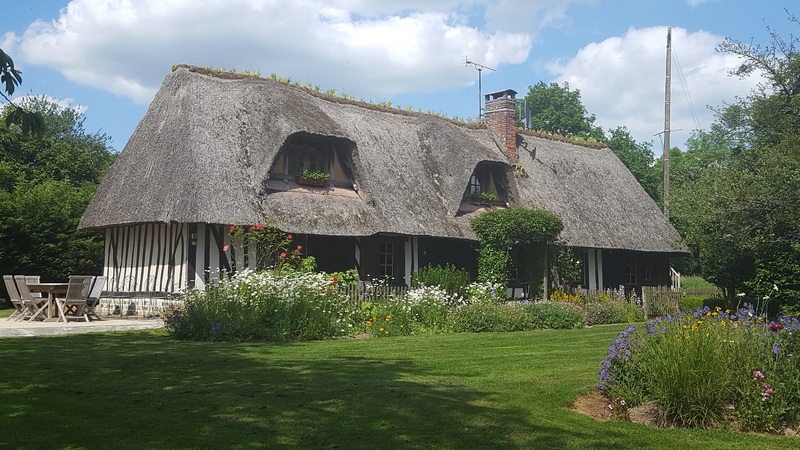 Set in a rural location in the heart of the Normandy countryside, 5 minutes from the market town of Pont Audemer, this traditional ‘chocolate box’ detached cottage set within the same spacious grounds as the owners, maintains its authentic Normandy charm but offers modern amenities.